photo source: Wikicommons "Aren't you supposed to say something complicated when you make a move?" asked the Younger, studying his old friend's thoughtful frown. "Queen to King's Rook 5, or something like that?" "Such a notion is antiquated," replied the Elder, not breaking his concentration. "These days, some people use algebraic notation, instead. But without a pad and paper, there's no point." 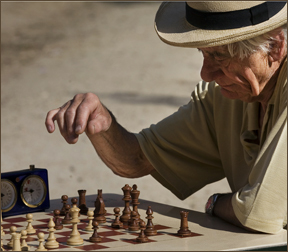 Their chess game was a new setting for the two friends, although the Elder's practiced ease gave away his familiarity with the outdoor park and its modest collection of chess enthusiasts. "It may not be Central Park in New York," he commented, looking up from their game for a moment. "But I like the vibe, as you young people like to say." The Younger chuckled as he moved his knight in what he hoped would be an advantageous direction. "People younger than me, maybe. Nothing ages you like graduation and joining the workforce!" His smile vanished as the Elder deftly countered his move, adding the knight to the growing collection of captured game pieces beside the chessboard. "Anyway, I wanted to ask you for your thoughts on something I heard the other day." The Elder looked up, all his attention on his young friend. "Something non-chess related, I assume?" he asked, as the spring breeze tousled his mane of grey hair. Placing his phone beside the chessboard, he scanned his potential moves with a furrowed brow as he continued speaking. "Some of my friends are very insistent that nobody should question what people are teaching, based on what Paul wrote to the Philippians. You've heard the slogans, probably. 'Don't judge', or 'doctrine divides, love unites'..."
"They're still using those slogans?" the Elder raised his eyebrows in surprise. "I heard them back when I was your age! There really is nothing new under the sun, I guess. Have your friends also considered what the same apostle Paul, inspired by the same Holy Spirit, also wrote to the Galatian churches?" The Younger sat up a little straighter, his hand poised to shift his rook, the gesture frozen. "Honestly, it does sound like Paul is talking out of both sides of his mouth. Not that I hear my friends quoting that particular verse all that often..." His voice trailed off as he remembered to move his rook. The Elder sighed, although it wasn't clear whether it was the topic at hand, or the ease with which he captured the Younger's rook. "In Philippians, Paul doesn't have a problem with what people were teaching about Jesus. Their motives are important, because God looks upon our hearts, but at least the message of Jesus Christ was being clearly proclaimed." And he deftly captured the Younger's queen. The Younger groaned at his gaffe, but looked up after making his next move with a different light in his eyes. "But with the Galatians, Paul was upset because they were being led astray by false teaching!" "Exactly," agreed the Elder. "And, I must apologize, but checkmate. Again." He picked up the Younger's king, using it almost as a pointer as he concluded. "Our motives are important, but it's the job of the Holy Spirit to bring correction. So, as long as the content -- the gospel of Jesus Christ -- was accurate, Paul was thrilled that the message was spreading. And, as you just pointed out, if the content of the preaching was error..."
"Paul went after it like a dog on a bone," the Younger finished. "So in reality, it's not really about the motives at all, but the content of the teaching, that ultimately makes the difference." "I couldn't have said it better myself," the Elder laughed, handing the chesspiece back to the Younger. "Another game?" The Younger shrugged with a wry smile. "Why not? I can be your 'chess disciple'... until I learn how to beat you at your own game." The Elder nodded sagely. "It's good for young people to have dreams to pursue," he murmured as if to himself. And he began to reset the game pieces on the board.